"Save patient's smiles from bruxism"
These therapy devices are designed to open the bite and protect the dentition. Relieving pain and preventing further destruction of existing healthy dentition. They can be worn during the day or at night to provide occlusal comfort. These devices are fabricated for precise fit and can incorporate hard/soft layers for comfort. The soft internal surface rests comfortably against the teeth and gums while the hard occlusal surface provides durability. 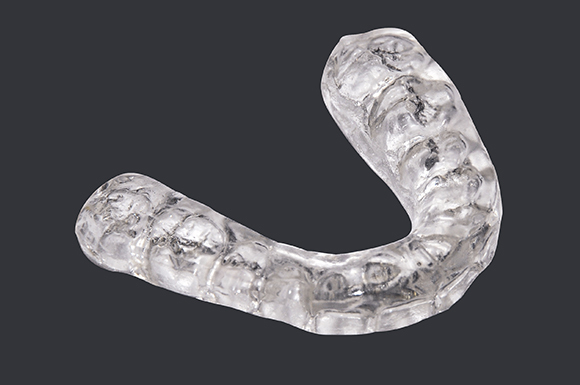 All Oral Design® bite splints and nightguards are constructed to your occlusal plane specifications on upper or lower arch. You can choose from soft material or hard/soft clear thermo-elastic base with memory.